Sometimes, a tumour can block the bowel, causing sudden strong pains in the stomach area, bloating and feeling or being sick. You may also be unable to empty your bowels or pass wind. If you think you have a blocked bowel, see your GP straight away or go to a hospital accident and emergency department. There are several possible causes of bleeding from your bottom or blood in your bowel movements (poo). Bright red blood may come from swollen blood vessels (haemorrhoids or piles) in your back passage. Dark red or black blood may come from your bowel or stomach. Tell your doctor about any bleeding so they can find out what is causing it. Tell your GP if you have noticed any persistent and unexplained changes in your bowel habit, especially if you also have bleeding from your back passage. You may have looser poo and you may need to poo more often than normal. Or you may feel as though you’re not going to the toilet often enough or you might not feel as though you’re not fully emptying your bowels. This is less common than some of the other symptoms. Speak to your GP if you have lost weight and you don’t know why. You may not feel like eating if you feel sick, bloated or if you just don’t feel hungry. Bowel cancer may lead to a lack of iron in the body, which can cause anaemia (lack of red blood cells). If you have anaemia, you are likely to feel very tired and your skin may look pale. You may have pain or a lump in your stomach area (abdomen) or back passage. See your GP if these symptoms don’t go away or if they’re affecting how you sleep or eat. Find out more about these conditions on nhschoices.nhs.uk. 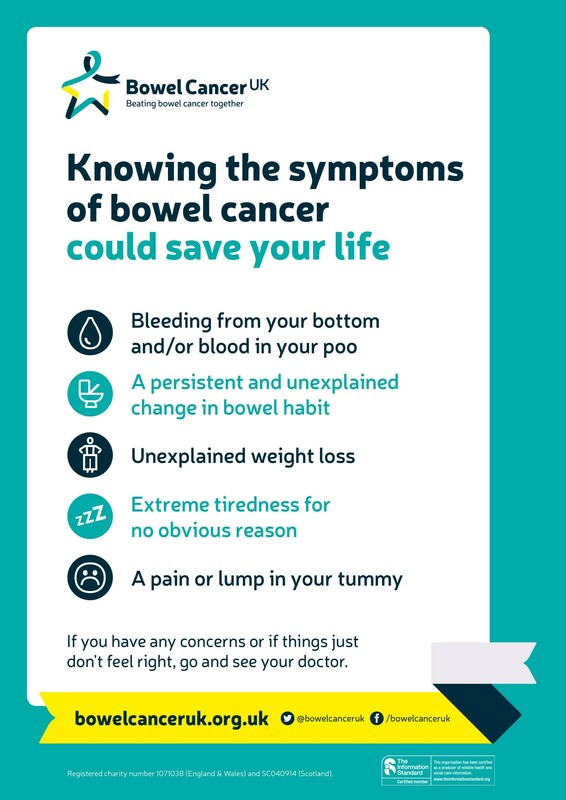 Read our information on diagnosing bowel cancer. For more information you can down load our health information booklets here. The symptoms diary, pioneered by one of our supporters Beth Purvis and supported by Coloplast, aims to help keep track of a person’s symptoms before they visit their GP. This will give a good indication to their doctor whether they need further tests. Patients may not remember all their symptoms during the short appointment so having something written down can be useful.